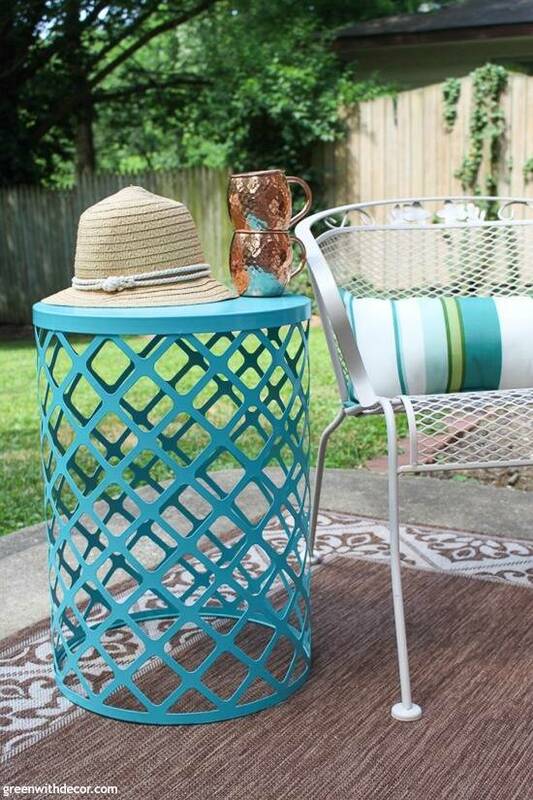 Follow this easy DIY tutorial for spray painting metal furniture. Be sure to use the best spray paint for outdoor furniture to get good coverage. Outdoor furniture goes through a lot. Fading from the sun, rust from the rain, scratches from falling over in the wind … guess we’re tackling all sorts of outdoor furniture DIYs around here this year! Here’s our newest painted outdoor table. 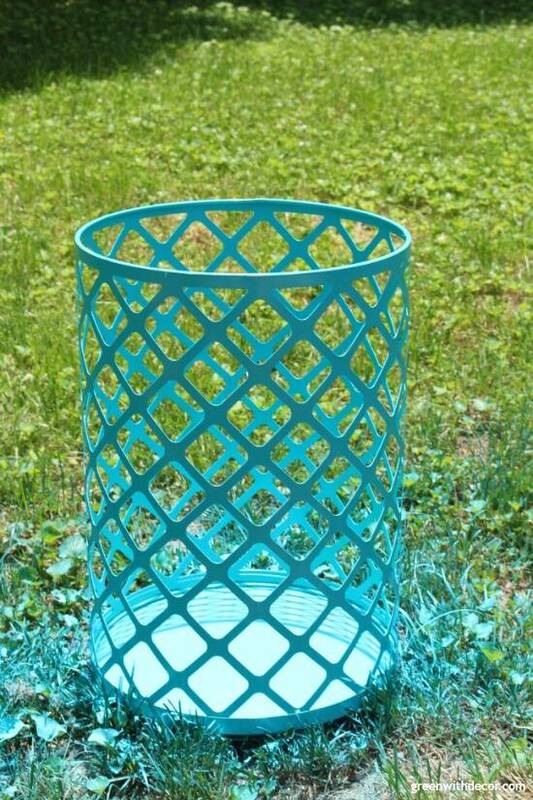 Isn’t the turquoise fun?! We got this little side table a few years ago. It’s the perfect size for holding a drink or two next to our outdoor couch. But after a few years in the blazing summer sun, it was a bit faded and in need of a refresh, wouldn’t you say?! I love these little end tables/garden stools and am thinking we’ll probably pick up another one or two at some point. But for now I’m glad we brought this one back to life. 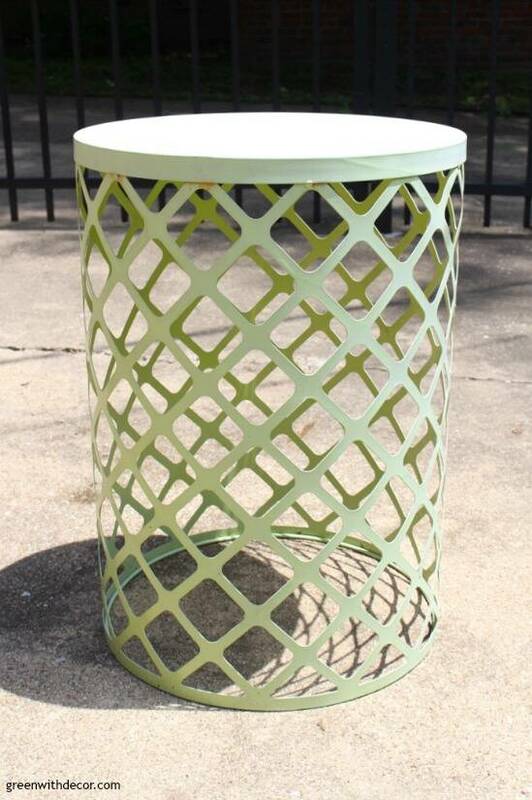 Spray paint is so easy for small projects like this table, and you pretty much need to use spray paint or a paint sprayer on metal furniture with all these openings or you’d go crazy trying to get in every nook and cranny with a paint brush! And with this paint, it’s paint + primer in one, so no need to worry about priming. A definite bonus if your outdoor furniture has some rust spots, which tend to happen. 1. Clean your outdoor furniture. The easiest way of course is just spraying it down with a hose. (We’re all about easy.) Or you can wipe furniture down with a damp cloth. Let it dry before painting. 2. Spray paint your furniture. Shake the spray paint can, and stand with the can about 8 inches from your furniture. Start spraying, moving the can back and forth to get even coverage and avoid drip marks. If it’s super humid or damp, I wouldn’t paint that day. 3. Do a second coat of spray paint. 4. Flip the table (or whatever you’re painting) over and do a coat of paint on the bottom/inside. Let it dry, and do a second coat. Let it dry again, and ALL DONE! So easy, right?! Do I have you convinced this is the best spray paint for outdoor furniture?! Doesn’t it look perfect with that turquoise striped pillow?! And our copper mugs I’m obsessed with! Our outdoor rug is a few years old, too, but this one is similar. I LOVE having an outdoor rug to make an outdoor space feel a bit cozier – especially if your patio is older like this one is. Just cover it up! Oh and what a surprise … guess who couldn’t stop following me around? 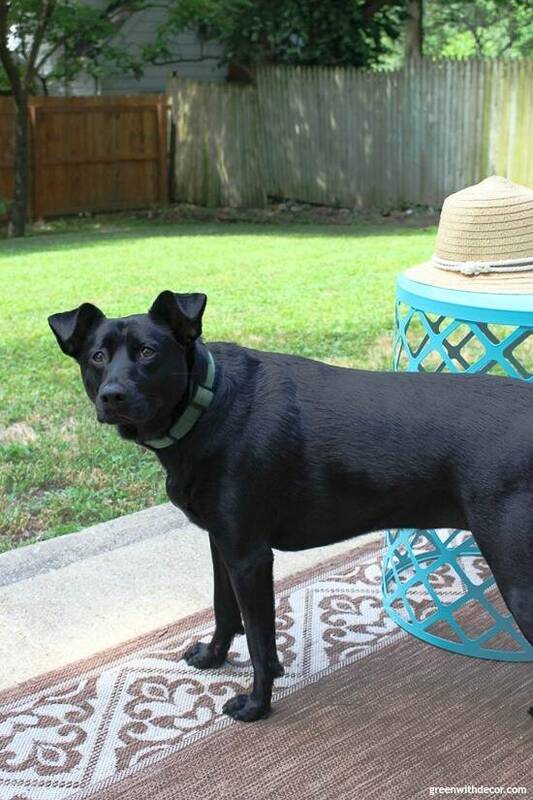 Oakley is obsessed with the camera but almost always turns away when we try to take her pic with our phones. Such a weirdo, but she’s a cutie. 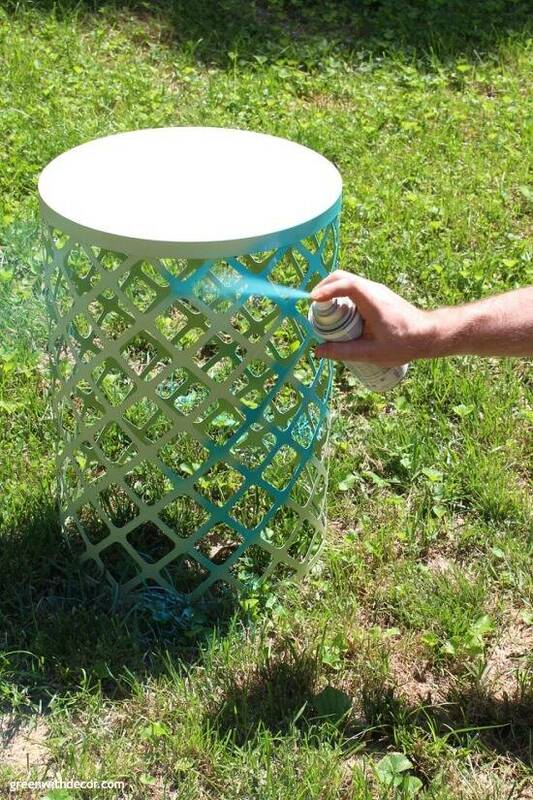 Have you spray painted any outdoor furniture lately? We’ve been on a roll lately!